Perfect for the Diva with a wild side. 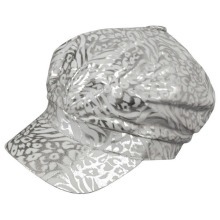 This newsboy style hat features a metallic Animal Print exterior and a fully lined interior. There is a covered elastic in the back to ensure a proper and comfortable fit. Hat has a 21 inch circumference. Hat brim is 2 inches wide. Hat crown is 6 inches high.